In the hamlet of Le Breuil, deep in the southern Beaujolais and perched above a narrow creek, the Domaine Dupeuble has been running almost continuously since 1512. The name of the domaine has changed just three times in its history, most recently when the last heir, Anna Asmaquer, married Jules Dupeuble in 1919. 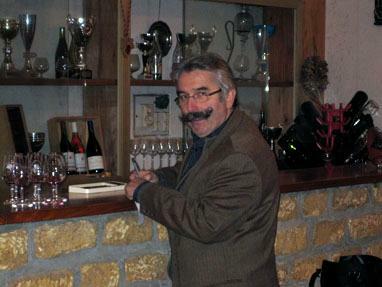 Anna's son Paul, and her grand children Ghislaine and Stéphane Dupeuble, manage the domaine. Kermit first met Ghislaine and Stéphane's father, Damien, for lunch in Paris in the late 1980s, and thus began the annual tradition of blending the KLWM Beaujolais Nouveau. Tradition runs deep in the family, but each generation has also managed to add something new, including increasing the property. Today it is comprised of one hundred hectares, about forty percent of which is consecrated to vineyards. Strong advocates of the lutte raisonnée approach to vineyard work, they tend their vines without the use of any chemicals or synthetic fertilizers. The vineyards, planted primarily to Gamay, face Southeast, South, and Southwest, and about two thirds of the property is on granite-based soil. The grapes are harvested manually and vinified completely without SO2. The wines are not chaptalized, filtered, or degassed and only natural yeasts are used for the fermentation. The wines of Dupeuble represent some of the best values in the Beaujolais today and are widely regarded for their very high quality and eminently reasonable price. Food & Wine Best Values of 2014"Domaine Dupeuble has been producing wine since 1512, and that experience shows in the consistency of their wine—fresh, vibrant and berry-bright every year, it’s especially appealing in 2013, a very good year for Beaujolais."